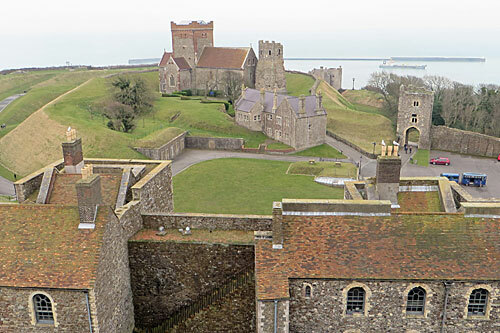 Few sites pack in Roman, Saxon, Medieval, Tudor, Georgian and 20th century history, but Dover Castle manages just that. That's mainly down to its position at the closest point to France, our country's key defensive location, which is also why it's the largest castle in England. Its success can be judged by the fact it's still intact, which helps explain the lofty price of admission. There is indeed a lot to see for your almost-twenty quid. The Roman bit is a lighthouse, essentially a tall tower with open windows which used to contain fires to help guide ships across the Channel. Just to see a building dating back two millennia is pretty amazing in itself. Immediately alongside is a Saxon church, this time 'just' the one millennium old, featuring an arched doorway (now bricked up) that's England's oldest. If you ever fancy getting inside Dover Castle for nothing, turn up on a Sunday morning and say you're going to St Mary in Castro, then join the other 30 worshippers for the morning service. 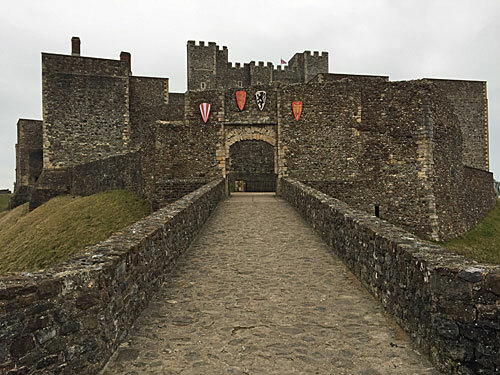 The castle proper dates back to William the Conqueror, begun pretty soon after he invaded, although most of what we see today is courtesy of Henry II. He had the place enlarged, originally to impress visitors from across the channel, but a more defensive role became necessary after relations with the French broke down. His Great Tower is the centrepiece of the design, one of the last rectangular keeps to be built in England, and also the most expensive. It's also enormously fun to explore. 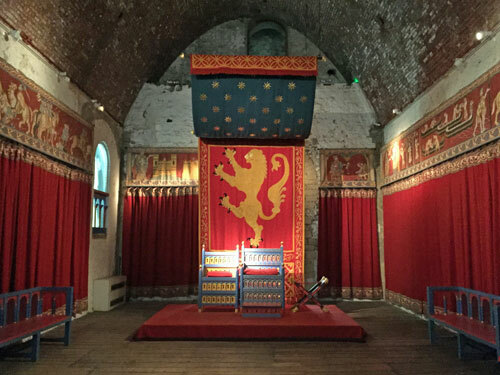 Within the tower are numerous large halls decked out with period drapes and replica medieval objects, and very few intrusive information panels. It's very much the place to take a selfie stirring a giant cauldron, or to queue to snap a photo of your beloved children sitting on a throne, rather than learning dry facts. But best of all is seeing where all the doorways lead. What initially looks like a few rooms up a few steps turns out to include two proper spiral staircases linking ground level to the roof, with all sorts of chambers and anterooms to delve into, and a dark passageway leading round the gallery at upper mezzanine level. For once you don't need to imagine what the inside of a castle would have looked like from its ruined shell, this is the real thing. Accessed elsewhere in the inner courtyard are Arthur's Hall, a 13th century survivor containing a historical exhibition, and the Princess of Wales's Royal Regiment Museum, especially for those who like weapons and regalia. I may have skipped the latter. I also skipped the coffee shop, not least because a bunch of French schoolchildren were inside hiding from the drizzle, and didn't spend long in the shop either. Instead I nipped back into the Great Tower for another Choose-Your-Own-Adventure, and to look down across all sides of Dover from the lofty platform on its drizzly roof. The castle's other big draw is going underground. The Medieval Tunnels are easily missed, but a spiral staircase in an outbuilding leads down into a steep passage ducking underneath the outer walls. At one point there's a choice between continuing past the cannons or descending down yet another staircase to deeper tunnels, which then branch in three directions. I felt like I should have brought a 12-sided dice to decide which way to go, and hoped I really was the only person down here and there wasn't a balrog in the gloom around the next bend. But the underground spaces most want visitors to see are the Wartime Tunnels. On busy days you may have to queue, but damp weekdays in early March aren't generally affected. A guide will lead you deep into the chalk cliffs where an unfolding audio-visual extravaganza tells the castle's WW2 story. These tunnels, or casemates, were first dug during the Napoleonic Wars to act as a secret barracks from which artillerymen could have dramatically emerged to repel cross-Channel aggressors. When the threat switched to Nazi invasion, military chiefs with telephones moved in and hid instead. Operation Dynamo - the retreat from Dunkirk - was coordinated from a gloomy chamber at the rear of this labyrinthine complex. A nicely-done dramatic recreation is projected onto its walls, the images familiar to anyone who's seen the film Dunkirk, but without boasting Oscar-level special effects. It really does bring the whole story home. Once you've finished the official bit you're left to explore the remaining casemates at your own pace, before walking out through the cliff face to look down over the ferries plying their way out of the harbour (and then nipping back in, to the cafe and gift shop). Another smaller set of tunnels are open separately, once used as a WW2 hospital annexe, and again with an audio experience to guide you through. I made the mistake of going in with a tranche of French schoolchildren, whose teachers tried their best to keep the group quiet, but whose muttering made it very difficult to hear the dramatic recreation. Pick your time carefully when you go down. 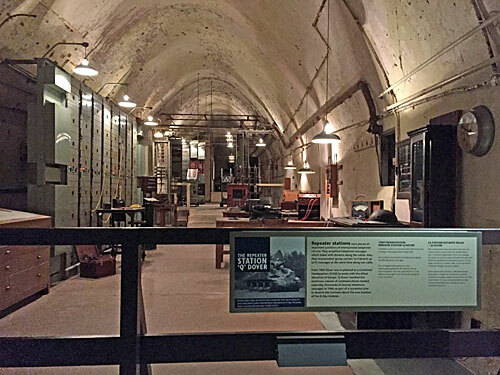 Thankfully the tunnels were never needed as a seat of government during a nuclear war, but given Dover's place in our national history it would have been a fitting way to go. And yay, that's five English Heritage properties I've visited so far this year, and my Annual Membership has already paid for itself.